The scheduling was on the tail end of a sequence of storms that left record amounts of snow in the Sierras. The snowfall east of US 395 was not enough to really stick as springtime’s longer days are bringing warmer temperatures. The wind was an issue, though. That means checking Road Trip Planner at Weather Underground for the route to see what weather to expect going and coming (as well as traffic and road conditions). At the rally, the mornings were usually quite nice but the winds that came up in the evening would rock you to sleep if you didn’t have the rig stabilizers out and down solid. See the photo gallery of the SNU Spring Breakout Rally at Week Heights! George, the park manager, says we need to visit later in the spring when the trees have leaves and things look a bit less bare. He’s got a point. It seems the winter Aleutian Low has stretched its influence a bit farther south than usual this winter. Cliff Mass says California Gets Hits on March 22. High winds at Point Reyes. Record rainfall in many locations in southern California. The general pattern is going to continue for a while, but with a shift of the precipitation into central and northern CA. The mountains of northern CA will get hit by 2-5 inches of rain. The Northern California Weather Blog has some water vapor pictures and weather charts showing the pressure cells. Normally, it seems, we get a big storm that comes in via the pineapple express from Hawaii and dumps quite a bit of snow then heads on east. This winter seems to be more of a mother low cuddling the Alaska and Canada coasts that is getting ripped by the jet stream to throw smaller storms at the California coast. Some of these ‘smaller storms’ are really rather strong which means we not only get a bit of snow on the mountain roads, we also get wind warnings. Both mean poor driving conditions, often with road controls and driving restrictions. So, for the SNU, its an emphasis on watching weather conditions and road controls just in time for another scheduled rally. That’s part of the reason for the choice of Weed Heights Full service RV Park as a rally site. 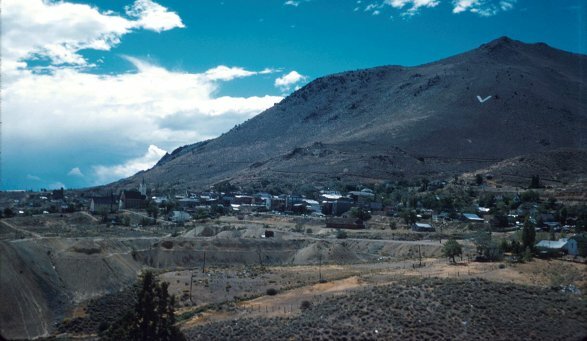 That has a nice club house for gatherings and full facilities for living convenience and common routes to Yerington tend to avoid the high wind and snow areas somewhat. On the positive side, though, is that much of the drought situation in the western U.S. has eased. The Sierra snow pack seems to be in good shape and lakes Powell and Meade are showing rising levels as the Colorado River drainage basin also gets some good snow. 2/19/57 – Curenavaca to Ixmiguelpan – weather good although windy. On arriving in Cuernavaca it was cloudy with a few drops of rain. Left Cuernavaca about 8:30 a.m. Long pull over mountain to Mexico City. Quite an experience driving through the city – made it O.K. Picked up two other trailers who followed us through. Stopped for lunch on road and picked up five more trailers, 9 of us all together. Very poor road, very bumpy – not many grades today. Wonderful farming country. Quite a bit of wind. Arrived in Ixmiguelpan about 3 o’clock – parked trailer in rear of service station for night – just two of us, lost other trailers – lights and water – 8 pesos – very reasonable and nice place to eat. Very old town. Left around 8 o’clock the next morning (Feb 20). The Weather was cloudy and rainy. This has been a day – up one mountain, down another – very crooked road. Ran into fog and rain.Very hard to follow road – slow driving – unable to see much of the country but the road was a marvel of engineering – beautiful. Rainy in Tamazunclle – drove on until about 5:30 and spotted a trailer park – lights, water, sewer, sulpher bath, 15 pesos per night including bath. Might stay over tomorrow. Very lush jungle growth – real tropics – farms on mountainside – bananas growing with papayas, pineapples, sugar cane. That was fifty years ago. Not much changed. A bit spiffed up, perhaps. 142,000 miles in a 1928 Graham-Paige car that tops out at 40 mph; visit 24 countries; build a family of 4 children along the way. “The Zapps have produced a book called Spark Your Dream which helps to fund the essentials like food and petrol.” Pictures at Ultimate road trip: couple drive 142,000 miles, visit 24 countries and have four children on Refreshing News. Some folks just dream, others live it. Others wonder how on earth they survived the experience or question whether its real or not. But how do you get from Argentina to Alaska via Asia and Australia, anyway? The Sierra Nevada Unit rally at Weed Heights is just around the corner. Dates are Thursday March 24 to Sunday March 27, 2011. For more information. Don’t forget to bring your decorative lights, your crockpot, and your favorite omelet ingredients. Also if you are interested in the Friends of the NRA dinner on March 26, email Dyann at president (at) sierranevadaairstreams.org for more information. An email from Gregg Ayers of NorCal is a reminder of the NorCal Rally in Bodega Bay. Dates are April 6 to 10, 2011. Gregg and his wife Valri are co-hosts for this rally. If you are interested, Gregg’s email is gdavea786 (at) yahoo.com Gregg and Valri attended the SNU rally at Obsidian Dome in 2010. They plan to join us again at Obsidian this August. Paula Poll sent an email about a Vintage Trailer Rally that is held in September in Buellton at Flying Flags. Paula says “Our unit (Central Coast) is going to do a unit rally there—it is so much fun. You don’t have to have a Vintage trailer to attend” The bad part is that this rally is the same weekend as the SNU South Lake Tahoe Anniversary Rally September Friday September 23 – Sunday September 25, 2011. The good news is the Vintage Trailer Rally is an annual event so it would be worth keeping in mind for 2012. For more information contact Paula at paula (at) lawbiz.com Paula and her husband Ed, also plan on being at the SNU Obsidian rally in August 2011. September Thursday September 22 to Sunday September 25, 2011. 2/18/57 – Cuernavaca – Left Acapulco at 5:45 a.m. – stopped on road about 9 for breakfast. Very pretty drive – lots of mountains – many small grottos. We stopped at one. Arrived in Cuernavaca about 2 p.m. Very poor road into town and in repair up hill all the way and very hard to pull. Cars got hot. Had a hard time finding campground – athletic field at the north end of town on the side of a mountain. Good place to camp but very run down – no showers or toilets in stadium – very poor shape. Car and trailer turned over just before getting into town – two women – driver fell asleep – no one hurt but plenty of damage to car and trailer. Protest riot in town after arrival – university students and police. Signed out of caravan today – on our own – some to Puebla, some to Toluca, some to Laredo, etc. 2/15/57 – warm (hot?) good breeze – breakfast with all the caravanners at 8:30 – nice get-together – after breakfast, trip to town for provisions. Bought a pair of sandals – haircut – home by noon. Lunch – over to beach all afternoon. Rented a chair, 2 pesos each – no fish – nice swim. Card from Paul Witten. Cooler today. Leave hear early Monday a.m. For Cuernavaca. Supper in patio – quite a breeze. 2/16/57 – Manana Fever – just didn’t do anything – two siestas – pretty warm – nice hamburger roast on beach by all the caravanners – nice swim before – great evening. 2/17/57 – Weather very warm – just took it easy. Will leave tomorrow for Cuernavaca early. Will go on through to Mexico City the following day on up toward Laredo with a sidetrip to Tampi CO. Lucknotts are going along, ww will leave the caravan. Nice swim in afternoon – supper on patio. Packing up afterwards for early start tomorrow. The March 2011 Newsletter has been posted. Links to photo galleries and additional information mentioned in articles in this newsletter can also be found there, too. Lunch at El Charro -|- SNU business meeting -|- Notes from the Prez -|- March Rally at Weed Heights -|- Off Grid-camping -|- Rose Parade Rally -|- Special Rallies & Events -|- Charter member remembered. The first SNU rally of 2011 will be March 24 to Sunday March 27 at Weed Heights RV Park. Activities include a crockpot pot luck and omelets in a bag. For more information and a map, see the link. For the latest on the Sierra Nevada Unit, check the homepage.